Charleroi is the city with the second-biggest airport in Belgium. It is very possible that you have passed through it without stopping on your way to Brussels or Liège. Our advice, however, is to drop in for a few hours. Here is why. Charleroi was built in 1666 by the Spaniards and the city was named after Charles II of Spain, who came to the throne when he was only 4 years old and generally his entire reign cannot be remember for anything good. Fortunately, the city was not tainted by his bad fame and it was conquered by the French only a year after. Later on Napoleon himself settled in Charleroi on the eve of the Battle of Waterloo. Charleroi is considered the capital city of the Walloon (French) comic books – some of the first Belgian stories in pictures were created here. This explains the fact that you often run into statues of popular cartoon characters here and there in the city. 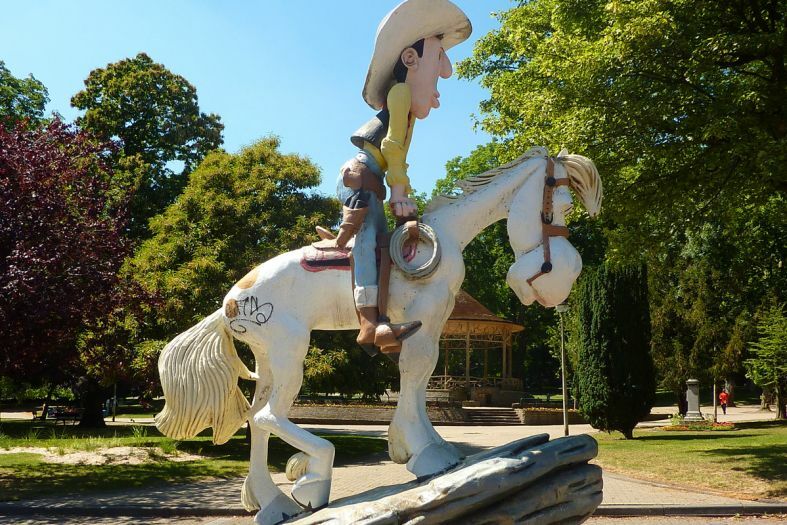 Lucky Luke, for instance, is seen at the entrance to the Reine Astrid Park. A minute of patriotism. The beautiful building of the Town Hall has 47 bells, which play the tune of the song “Land of Charleroi – It is you I love best” every hour. We guess that the bells regularly remind the mayor and his employees what they should love the most in their life. The Town Hall is situated on Charles II Square (yes, the same Charles II, who reigned the city for one year when he was 4). The dancing fountains and the Cathedral are found here, too. Charleroi has a Glass Museum, which features both exquisite items of modern times and such that gradually bring you back to the past. The museum is located in Bois du Cazier – an abandoned coal mine where one of the severest incidents in the history of Belgium occurred back in 1956. A fire in the mine killed 262 people, half of whom Italians. The mine is no longer functioning and now it shelters an exhibition dedicated to the fire and the mining industry in Belgium (together with the Glass Museum). You can reach Bois du Cazier (in Marcinelle) by bus No 52 from Charleroi-Sud station or by foot for about 30 minutes. The Town Hall houses the Museum of Fine Arts (Musée des Beaux-Arts), while the Photography Museum (Musée de la Photographie) is situated on 11 Paul Pastur Avenue. The castle is a beautiful XVII century building, which is perfectly fitting into Charleroi’s urban architecture. The first floor shelters the city library, while the second – the offices of the administrative services of Wallonia (the French-speaking part of Belgium). There is also a nice garden with benches. To reach Charleroi from the airport you should take bus A, which will take you to the city in 20 minutes. What is Couchsurfing – or welcome to my couch!